In parts of China, dumplings (jiaozi) are traditionally eaten at midnight on Chinese New Year's Eve. However, in northern China, these are eaten year-round. 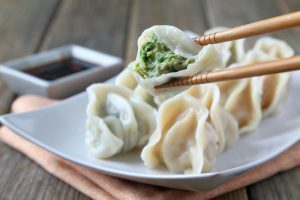 Trying to unearth Australia’s best dumpling restaurants is a bit like cramming a piping hot Xiao Long Bau into your mouth; you quickly realise you’ve bitten off more than you can chew! By no means a definitive list, here we’ve assembled ten of the best dumpling restaurants in Australia, known for their quality, consistency and authenticity. And if we’ve missed your favourite dumpling restaurant, be sure to let us know! One of the first places to serve Xiao Long Bau in Melbourne, HuTong continues to do a roaring trade in the signature soup dumplings at their Chinatown and Prahran restaurants. Add a serve of Wontons in Chilli Oil to your order. For Japanese-style dumplings in Brisbane and Sydney, get yourself to Harajuku Gyoza. Their famous Gyoza come poached or grilled, filled with classic combos, such as duck, vegetables or pork, plus more inventive options like the deep-fried Three-Cheese Gyoza. Since launching as a humble dumpling stall in Taiwain in 1972, Din Tai Fung has become a global phenomenon. In Sydney and Melbourne, you can sink your teeth into their freshly folded Xiao Long Bau, brimming with rich porky flavour. For added indulgence, order the crab meat and roe version. Another international success story, the original Tim Ho Wan in Mongkok, Hong Kong, made headlines when it became the world’s cheapest Michelin-starred eatery. While the four outposts—one in Sydney and one in Melbourne—don’t have quite the same charm as the first, you can still be assured of quality Cantonese classics, such as prawn Har Gow and pork Siu Mai. Though not a dumpling as such, be sure to order the Barbecued Pork Bun! Shake up your dumpling routine with a visit to ShanDong MaMa in Melbourne, where ‘Mama’ handcrafts sublime Fish Dumplings flavoured with dill. We admit we’re in danger of turning into fat dumplings after too many serves. At Fat Dumpling’s two eateries in Fortitude Valley, you’re spoiled for choice, with poached, steamed and pan-fried versions filled with pork and cabbage, prawn and garlic, chicken and asparagus, fish or vegetables. Dumpling lovers in Perth have been queuing up at Authentic Bites Dumpling House for their juicy Xiao Long Bau and Pan-Fried Pork Buns with a crunchy base. At cheap and cheerful Bam Bam Boo in Perth, expect a dizzying array of dumplings, including Chilli Shui Jiao filled with pork and cabbage, Crispy Pork and Chive Dumplings, and The Colour Set with a rainbow of brightly coloured dumplings. For a traditional yum cha experience in Adelaide, head to Star House Chinese Restaurant on Gouger Street, where the trolleys brim with all your Cantonese favourites, including Har Gow, Siu Mai and fluffy Pork Buns. In the Top End, our top tip is Steam Up in Darwin, for yum cha favourites, such as silky Scallop Dumplings, fluffy Buns and Steamed Rice Rolls.